Ah, don't you just love the madness that Black Friday is? Of course you do! It is the time when we get one of the very best deals for gear that would otherwise cost us substantially more. Sprint Samsung Galaxy S III for $49.99. What do you say - is Best Buy being generous enough, or they should try harder? You may also notice that some of the discounted devices are Sprint's Galaxy S II and AT&T's Galaxy S II Skyrocket... geez, are they still selling those? Looks like someone's trying to clear some old inventory out, huh? Nice, GS3 gonna get even more sales. Fail for APPLE pricing. What about the Galaxy Note 2?!!!! I'm surprised that the author of this article haven't made a correction to this page as of yet... So many readers have pointed out that Best Buy is not having this black friday sale... Could it be that Ray has left for his vacation already? Waaaaassssup. 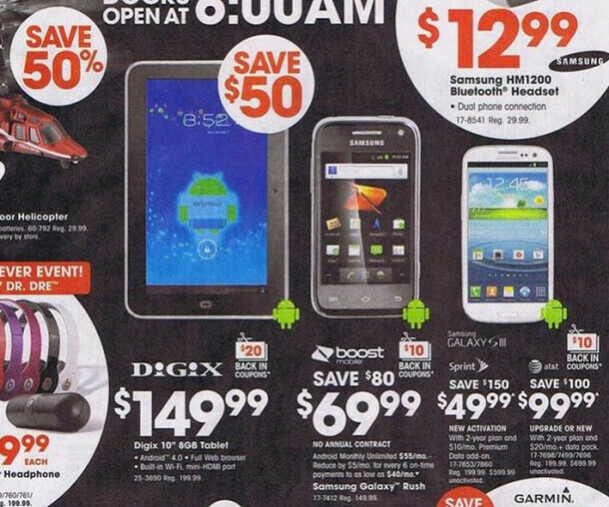 The pics in the article are obviously the leaked radioshack ad not a bestbuy ad. 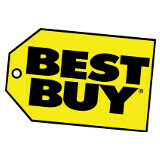 Even the source blatantly says radioshack not bestbuy. Time for another retraction phonearena? Wow, My ribs hurt now. This has absolutely nothing to do with "how greedy apple are"....Stop bringing your apple hate into every article...move on. Those two phones are still sold for their respective carriers and for more. Just saying. These look like Radio Shack offers. I think everyone has already concluded that these are radio shack deals. You failed to mention that they'll have the Sprint Galaxy S3 is only $49.99. You win the award for 'Failure to Read!' Congratulations! Why do people come in here and bash the iPhone and Apple because they don't drop their prices or make sweat deals? Will it matter to you? 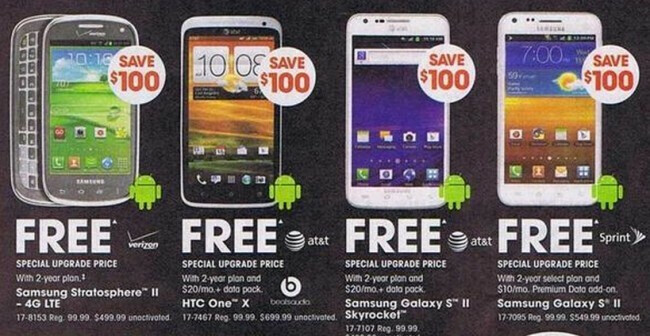 If you are a devout Android user, you wouldn't buy the iPhone no matter what price it is (except maybe free unlocked). I'm a fan of Android and Google, but people take their choice of phone too seriously. Some people sound worse than two people arguing which religion is best. That makes too much sense for them. these are cheap phones on sale, iphone 5 is the real phone on the market..